57 w w w . M o d e r n T i r e D e a l e r . c o m or something like that," says Joe, who believes the Dr. Tire name has definitely helped the business. e brothers' father, Joe Jr., and their uncle, Gene Bostick, started the business in 1972 under the name Mr. Tire. "en in '74 they had to change the name because somebody else already had that name," says Joe, who has since registered the name in South Carolina. Joe and Robert took over Dr. Tire from their father in 1989. WHOLESALE CHANGES Dr. Tire sells Michelin, BFGoodrich, Uniroyal, Multi-Mile, Continental, Coo- per, Goodyear, Nexen, Nitto, Sumitomo and Vogue consumer tires, and Primex, BKT, Alliance, Firestone and Goodyear commercial tires. But Joe says they can get any tire the customer wants. 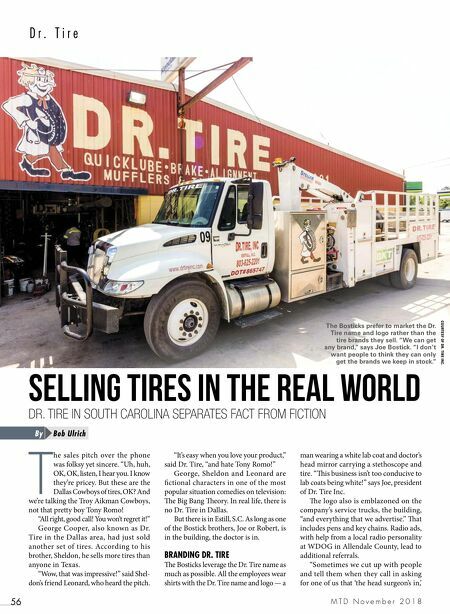 "We have five suppliers we typically deal with: Carroll Tire, Treadmaxx, ATD, Alliance Tire and S&S Tire," says Joe. But the face of wholesaling is changing, and the Bosticks are right in the middle of it. • TBC Corp.'s Carroll Tire merged with Michelin North America Inc.'s TCi to form NTW (National Tire Wholesale). • Treadmaxx Tire Distributors Inc., which is run by Kauffman Tire Inc., has partnered with Max Finkelstein Inc. to form a buying group, Tire Distributors of the Americas LLC. • American Tire Distributors Inc. is reorganizing. As a result, long-standing delivery routes and policies are changing. For example, Robert, the company's vice president, says S&S stopped regular deliveries to rural Estill, "so we have to get a big order together for them to come to us. ere are a lot of changes going on with our wholesalers. We're waiting to see if it is for better or worse." TECHNICIAN DIFFICULTIES e town of Estill, S.C., in Hampton County has a population of only 2,000 people, although recent growth in the logging industry in the area may help increase that. "Most of the people who live here work in other cities like Beaufort, Bluon, Hilton Head and Savannah," says Joe. "Finding techs has been a challenge. We're constantly looking for techs. It's because of the geographic area we're in. We also try to draw from the surrounding counties." 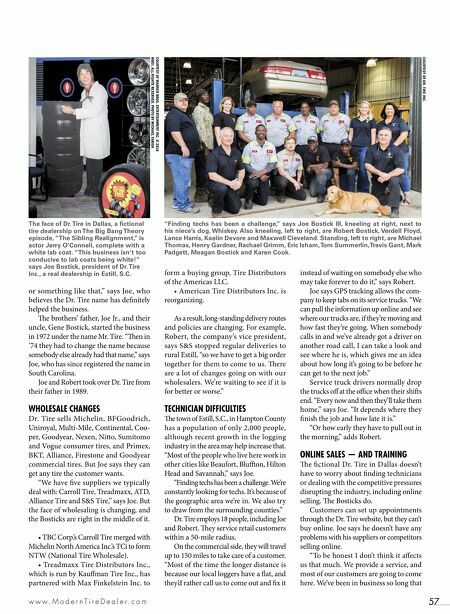 Dr. Tire employs 18 people, including Joe and Robert. ey service retail customers within a 50-mile radius. On the commercial side, they will travel up to 150 miles to take care of a customer. "Most of the time the longer distance is because our local loggers have a flat, and they'd rather call us to come out and fix it instead of waiting on somebody else who may take forever to do it," says Robert. Joe says GPS tracking allows the com- pany to keep tabs on its service trucks. "We can pull the information up online and see where our trucks are, if they're moving and how fast they're going. When somebody calls in and we've already got a driver on another road call, I can take a look and see where he is, which gives me an idea about how long it's going to be before he can get to the next job." Service truck drivers normally drop the trucks off at the office when their shis end. "Every now and then they'll take them home," says Joe. "It depends where they finish the job and how late it is." "Or how early they have to pull out in the morning," adds Robert. ONLINE SALES — AND TRAINING e fictional Dr. Tire in Dallas doesn't have to worry about finding technicians or dealing with the competitive pressures disrupting the industry, including online selling. e Bosticks do. Customers can set up appointments through the Dr. Tire website, but they can't buy online. Joe says he doesn't have any problems with his suppliers or competitors selling online. "To be honest I don't think it affects us that much. We provide a service, and most of our customers are going to come here. We've been in business so long that COURTESY OF DR. TIRE INC. COURTESY OF WARNER BROS. ENTERTAINMENT INC. © 2018 WBEI. ALL RIGHTS RESERVED. PHOTO BY MICHAEL YARISH The face of Dr. Tire in Dallas, a fictional tire dealership on The Big Bang Theory episode, "The Sibling Realignment," is actor Jerry O'Connell, complete with a white lab coat. "This business isn't too conducive to lab coats being white!" says Joe Bostick, president of Dr. Tire Inc., a real dealership in Estill, S.C. "Finding techs has been a challenge," says Joe Bostick III, kneeling at right, next to his niece's dog, Whiskey. Also kneeling, left to right, are Robert Bostick, Verdell Floyd, Lance Harris, Kaelin Devore and Maxwell Cleveland. Standing, left to right, are Michael Thomas, Henry Gardner, Rachael Grimm, Eric Isham, Tom Summerlin, Travis Gant, Mark Padgett, Meagan Bostick and Karen Cook.